Wave/serpentine bike rack. My favorite design, good for mini-U-locks and cable locks both. "Wheelbender" bike rack. This is the most common, but my least favorite. Better than nothing, though! Having a secure place to lock your bike is one of the most important aspects of using your bicycle for transportation. Unfortunately, this can be a challenge in a car-centric town like Pocatello. With a cable lock, you can typically find something to lock your bike to at any given destination -- tall trees and posts, railing, etc. This is a bit more tricky with a U-lock, especially a mini, which, when used properly, can secure both your rear wheel and frame at the same time. Despite the convenience of cable locks, they are more easily defeated than a good U-lock. For this reason, I recommend using them only for quick errands, or in addition to a U-lock, whenever possible. 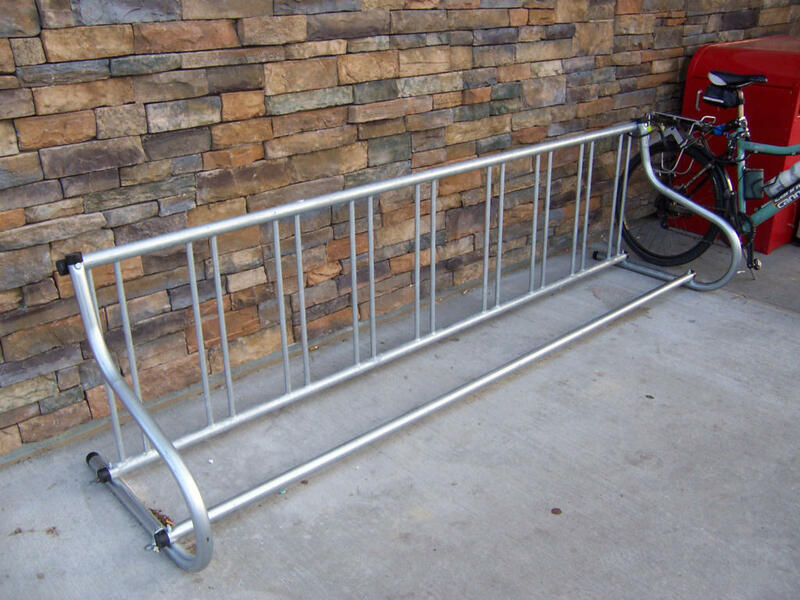 The most common bike rack is known colloquially as a wheelbender. 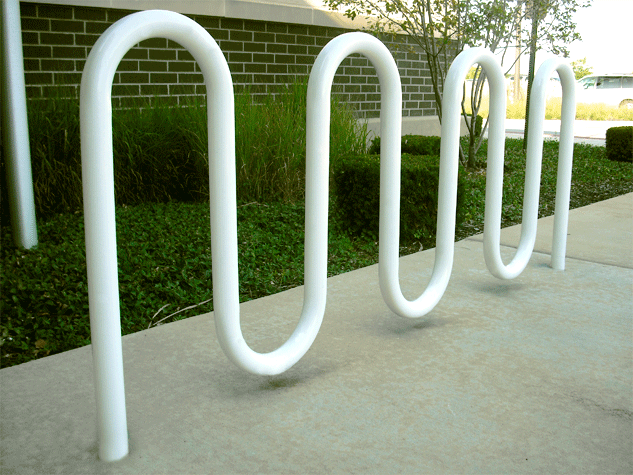 These racks feature many slots to park the front wheel of a bicycle into, and are typically only suitable for cable locks (though it's sometimes possible to use the ends with a U-lock.) In addition, it's possible to, well, bend your wheel! A full wheelbender rack is susceptible to a domino effect if one bike falls on the side of another. My favorite kind of bike rack is a basic wave/staple made of thick-gauge metal that is cemented directly into the ground. These work well with both a mini U-lock and a cable lock, won't bend your wheels, and are typically much heavier gauge metal than standalone racks. I have compiled a list of businesses/destinations below that provide bike racks. I have prioritized the wave design. If you would like to add to this list/report any errors, please contact me.